← Not Perfect, But Progress! The Cozi app is awesome! We appreciate it so much! I just had to take a few minutes to share an app with you that has literally helped my family in so many ways – I can’t even express the thankfulness for this app. You all have calendars right? I did too – I had the monster “MOM” desk calendar that opened all the way up. It had all of our main appointments on it, as well as some work deadlines, and photography sessions… For the most part it worked well for me, but we couldn’t seem to stay on track of when my husband had important meetings or even reminders of when things were before they were “BLAM!” that day. Lots of conversations were had of, “I didn’t know you had that appt…” or “was that even ON the calendar yesterday?” We were… becoming a BIT disorganized, and things were about to get even crazier this fall. I will say before 16 little hands and feet were in the mix, I used to be pretty organized and timely… I actually was KNOWN for being on time. Ironically, I’m pretty sure I’m known for almost always being late. But, in my defense – with a few little people working against you on road we call life, sometimes things get a little mixed up in our minds each week. I subscribe to FLYLADY on Facebook, and she often has great encouragement and suggestions for staying on track in organizing and decluttering your home… we like to call it “blessing our home”… This past spring she shared an app for your smart phone called “Cozi” and it has been a HUGE blessing to us! So how does this tie into being healthy for Him and staying on track? Well, along with the calendar part of the app, and the reminders you can set it up with, it has shopping lists, by store – that you can set up to keep you organized as well! It helps to make sure I’m not missing any produce, or key grocery items whenever I’m in town to pick up a few things. (Which is often a reason people make POOR decisions, lack of planning ahead!) 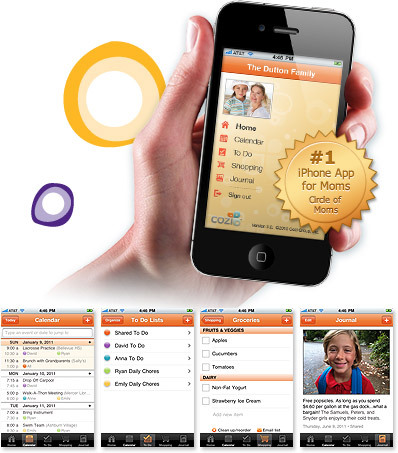 You can also email the lists to any other phone or to your computer… and it’s always with you! Perfect! Now you don’t need a special app for this, but I often set alarms to remind myself it’s snack time, or to remind myself to plan for dinner that night, or breakfast the next day. It’s SO great! Thanks Flylady! Smart phones are one of the major reasons I love technology! (The other is internet shopping in the peace and quiet of my home!) So download the app – let me know what you think, and if you already have it – tell me how you make it work for you! Posted on September 28, 2011, in Our Struggles, Uncategorized and tagged Cozi App, Flyflady, healthy eating, healthy for God, healthy for him, worship in body. Bookmark the permalink. Leave a comment.